For other uses, see Order of the Black Eagle (disambiguation). The Order of the Black Eagle (German: Hoher Orden vom Schwarzen Adler) was the highest order of chivalry in the Kingdom of Prussia. The order was founded on 17 January 1701 by Elector Friedrich III of Brandenburg (who became Friedrich I, King in Prussia, the following day). In his Dutch exile after World War I, deposed Emperor Wilhelm II continued to award the order to his family. He made his second wife, Princess Hermine Reuss of Greiz, a Lady in the Order of the Black Eagle. Members of ruling houses, senior civil and military officials and other worthy figures appointed by the King of Prussia. The statutes of the order were published on 18 January 1701, and revised in 1847. Membership in the Order of the Black Eagle was limited to a small number of knights, and was divided into two classes: members of reigning houses (further divided into members of the House of Hohenzollern and members of other houses, both German and foreign) and capitular knights. Before 1847, membership was limited to nobles, but after that date, capitular knights who were not nobles were raised to the nobility (Adelsstand). Capitular knights were generally high-ranking government officials or military officers. The Order of the Black Eagle had only one class, but could also be awarded at the king's prerogative "with the Chain" ("mit der Kette") or without ("ohne Kette"). By statute, members of the order also held the Grand Cross of the Order of the Red Eagle, and wore the badge of that order from a ribbon around the neck. From 1862, members of the Prussian royal house, upon award of the Order of the Black Eagle, also received the Prussian Crown Order 1st Class. The badge of the Order was a gold Maltese cross, enameled in blue, with gold-crowned black eagles between the arms of the cross. The gold center medallion bore the royal monogram of Friedrich I ("FR", for Fredericus Rex). This badge was worn from either a broad ribbon (or sash) or a collar (or "chain"). The ribbon of the Order was an orange moiré sash worn from the left shoulder to the right hip, with the badge resting on the hip. The sash color was chosen in honor of Louise Henriette of Nassau, daughter of the prince of Orange and first wife of the great elector. The collar or chain (Kette) was worn around the neck and resting upon the shoulders, with the badge suspended from the front center; the collar had 24 elaborate interlocking links: alternately a black eagle and a device featuring a center medallion with the motto of the Order (Suum Cuique—literally "To each his own," but idiomatically "To each according to his merits"), a series of FRs forming a cross pattern, a blue enameled ring around this, and crowns at each cross point. The star of the Order was a silver eight-pointed star, with straight or faceted rays depending on the jeweler's design. The center medallion displayed a black eagle (which gripped a wreath of laurels in its left claws and a scepter in its right) on a golden background, surrounded by a white enamelled ring bearing a wreath of laurels and the motto of the Order. At meetings of the chapter of the Order of the Black Eagle and at certain ceremonies, the knights wore red velvet capes with blue linings. Embroidered on the left shoulder of each cape was a large star of the Order. From its founding in 1701 to 1918, the Order of the Black Eagle was awarded 407 times, with 57 of these installations occurring during the reign of Friedrich I (1701–1713). In 1918, the knights of the order totalled 118 — 14 were members of the Prussian royal house, one was a member of the Princely House of Hohenzollern, 49 (of whom nine were from states then at war with Germany) were members of other reigning houses, and 54 (including 17 who had not yet been fully installed) were nonroyal Germans. Subjects of the Prussian King receiving the order which was only given in one class were promoted to the peerage and received hereditary title. From the Prussian State Handbooks, it is clear that the Order of the Black Eagle (as well as, by statute, the other Prussian orders, as mentioned above) was conferred upon all male members of the royal family on their 10th birthdays; these men the collar of the Order on their 18th birthdays. 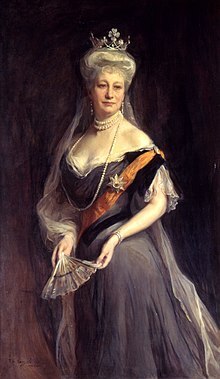 The Order was also conferred upon Prussian queens (and, later, German empresses), though other female members of the royal family usually received the Order of Louise instead. Frederick William, Margrave of Brandenburg-Schwedt, Prince in Prussia (1700–1770) — nephew of Friedrich I.
Kronprinz Wilhelm (1882–1951) — Crown Prince of Germany and Prussia until 1918, World War I-era German general. Prince Arthur, Duke of Connaught and Strathearn (1850–1942) — Kaiser Wilhelm II's uncle, he was still a member of the order in 1918 despite being a British military officer. Carol I of Romania — King of Romania (1866–1914); member of the Princely House of Hohenzollern. Edward VII — King of Great Britain and Ireland, Emperor of India (1901–1910). Leopold I, Prince of Anhalt-Dessau — Prussian field marshal known as the "Old Dessauer"
Leopold II of Belgium — King of the Belgians (1865–1909). Louis XVIII — King of France. Ludwig II of Bavaria — King of Bavaria (1864–1886). Grand Duke Mikhail Aleksandrovich of Russia — Tsar Nicholas II's brother, Tsar presumptive sometimes referred to as "Tsar for a day" (15–16 March 1917) who was also the regimental chief of Ulanen-Regiment "Kaiser Alexander III von Rußland" (Weßtpreußisches) Nr. 1. Emperor Meiji – Emperor of Japan (1867–1912). Naser al-Din Shah Qajar — Shah of Persia (1848–1896). Nicholas II — Last tsar of the Russian Empire. Emperor Taishō — Emperor of Japan (1912–1926). Umberto I of Italy — King of Italy (1878–1900). Victor Emmanuel III — king of Italy (1900–1946). William III of the Netherlands — King of the Netherlands and Grand Duke of Luxembourg (1849–1890). Henning Alexander von Kleist (1677–1749) — Prussian general, field marshal, for action at the Battle of Mollwitz. Gebhard von Blücher — Prussian field marshal and leader of Prussian troops at the Battle of Leipzig and Battle of Waterloo. Leonhardt von Blumenthal — Prussian field-marshal, 1877. Bernhard von Bülow — German chancellor and statesman. General Mikhail Chertkov (sometimes written Tchertkoff) — Russian Governor-General of Warsaw — September 1902 — when he visited Posen for German army maneuvers. Karl von Einem — World War I-era German general and Minister of War. Prince Philip of Eulenburg — German politician and diplomat. August von Gneisenau — Napoleonic-era Prussian field marshal. His insignia of the order was formerly Napoleon's. Gottlieb Graf von Haeseler — German field marshal. Paul von Hindenburg — World War I-era German field marshal and later president of Germany. Friedrich Graf Kleist von Nollendorf — Napoleonic-era Prussian general (promoted to field marshal two days before his death). August von Mackensen — World War I-era German field marshal. Patrice de Mac-Mahon, duc de Magenta — French politician; first president of the Third Republic. Adolph Menzel — German artist. Helmuth von Moltke the Elder — Prussian field marshal of the German wars of unification. Served as chancellor of the Order of the Black Eagle. Napoléon Bonaparte — Admitted in 1803 when he was First Consul. Ernst von Pfuel — Prussian general and Prime Minister of Prussia. Friedrich Wilhelm von Seydlitz — Prussian cavalry general under Frederick the Great. Friedrich Bertram Sixt von Armin — World War I-era German general. Alexander Suvorov — Napoleonic-era Russian general and Generalissimo. Alfred von Tirpitz — German Admiral. Alfred von Waldersee — German field marshal and Supreme Commander of the Eight-Nation Alliance in the Boxer Rebellion. Ludwig Yorck von Wartenburg — Napoleonic-era Prussian field marshal. Johann Jakob von Wunsch — Wuerttemberg-born Prussian general. The Order of the Black Eagle is currently used as the emblem of the German Military Police (Feldjäger). ^ a b Preußische Orden. ^ Werlich, Orders and Decorations, p. 182. ^ a b 1918 Prussian State Handbook, p. 38. ^ It is unclear whether this number only covers capitular knights, or also includes members of reigning houses. ^ 1918 Prussian State Handbook, p. 38–41. ^ a b c "Court Circular". The Times (36043). London. 19 January 1900. p. 7. ^ "Latest intelligence - Germany". The Times (36781). London. 30 May 1902. p. 5. ^ "Latest intelligence - The German Emperor at Posen". The Times (36864). London. 4 September 1902. p. 3. ^ "Court Circular". The Times (36877). London. 19 September 1902. p. 7. ^ "No. 2731". The London Gazette. 7 May 1901. p. 3123. ^ "Latest intelligence - The King of Italy in Berlin". The Times (36859). London. 29 August 1902. p. 3. This article incorporates text from a publication now in the public domain: Chisholm, Hugh, ed. (1911). "Simson, Martin Eduard von" . Encyclopædia Britannica. 25 (11th ed.). Cambridge University Press. pp. 136–137. Robert Werlich, Orders and Decorations of all Nations (Quaker Press, 2nd edition 1974). Handbuch über den Königlich Preußischen Hof und Staat für das Jahr 1874, (Berlin, 1873). Handbuch über den Königlich Preußischen Hof und Staat für das Jahr 1883, (Berlin, 1882). Handbuch über den Königlich Preußischen Hof und Staat für das Jahr 1907, (Berlin, 1906). Handbuch über den Königlich Preußischen Hof und Staat für das Jahr 1918, (Berlin, 1918) (herein "1918 Prussian State Handbook"). Preußische Orden (herein Preußische Orden). Rangeliste Der Königlich Preußisches, Für 1903. Berlin: Ernst Siegfried Mittler & Son, 1903. "Eagle, Black" . New International Encyclopedia. 1905.